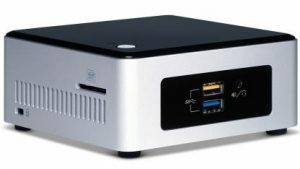 Unless you have a particular need for a custom built computer, such as video editing or gaming, the Intel NUC might be just for you. yep, it’s small…. 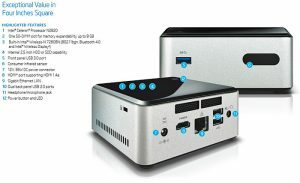 really small, you can even mount it behind your monitor. We offer two versions, the main difference being the hard drive, either standard laptop 2.5″ 1Tb or SSD (Solid State). SSD is great if you don’t need a lot of onboard storage, like POS (Point of Sale) or Workstations. And the 1Tb model is suited for everyday home use, with wireless connectivity built in.